Since we returned from our vacation to Los Angeles this past June, Tawn has been in the process of designing and producing his initial collection of women’s wear. It has been a challenge and an adventure as he locates vendors, deals with problems anticipated and unanticipated, and learns about how a fashion business is run. They say that success is a combination of talent, lots of hard work, and a dose of good luck. 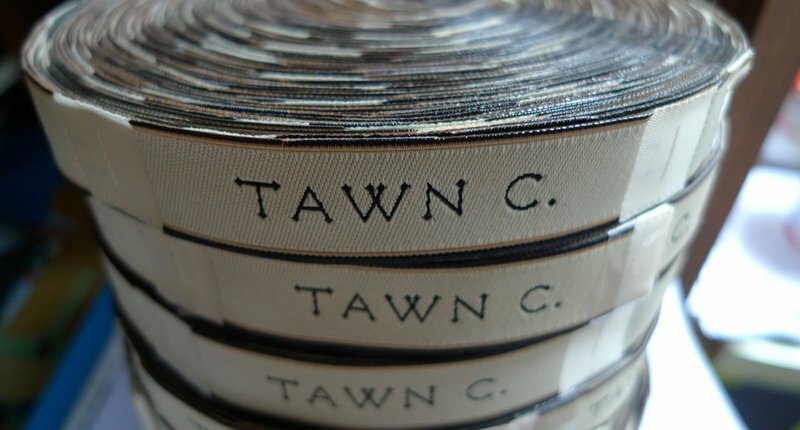 Right now, we’re at a point on the road to Tawn’s dream of being a successful fashion designer where those three factors are coming together. It is a point that, years from now, we may look back on as the critical break that altered the course of his career. A month ago, Tawn had the opportunity to meet Khun Kai, the man who established the first haute couture brand in Thailand some forty years ago. 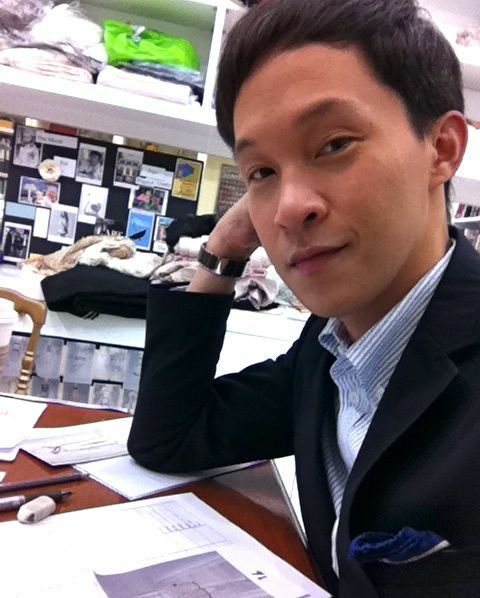 He continues to produce elegant dresses and wedding gowns that are highly sought-after. 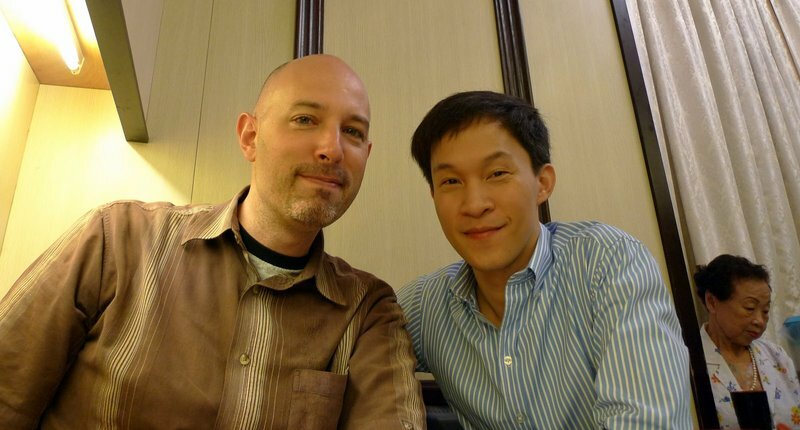 While helping a friend shop for her wedding gown, Tawn introduced himself to Khun Kai and inquired if he might consider taking Tawn as an intern. Initially, Khun Kai said he was not interested in having an intern. A week later, though, Tawn received a call and was invited to Khun Kai’s studio. Starting the next day, Tawn listened as Khun Kai shared his insights on the fashion industry in Thailand and the challenges of running your own design studio. The day after that, Khun Kai explained that he was looking for a designer to help produce the Spring/Summer 2012 collection for “k and i”, Kai’s streetwear brand. Introduced two seasons ago, k and i has yet to establish a solid identity and find its market. Out of the blue, Khun Kai asked Tawn to design that Spring/Summer collection for k and i. Returning home that evening, Tawn was understandably excited and a little stressed by the challenge. He worked late into the night, creating a mood board to capture his overall design inspirations for the collection and then sketched 48 rough looks to articulate how he thought k and i could best fit into the market. With some feedback, Khun Kai approved the looks and after he and Tawn chose various fabrics, his in-house team of seamstresses began preparing prototypes. The collection will show, along with Khun Kai’s “Kai” couture line, October 8 at Bangkok International Couture Fashion Week, sponsored by Harper’s Bazaar magazine. 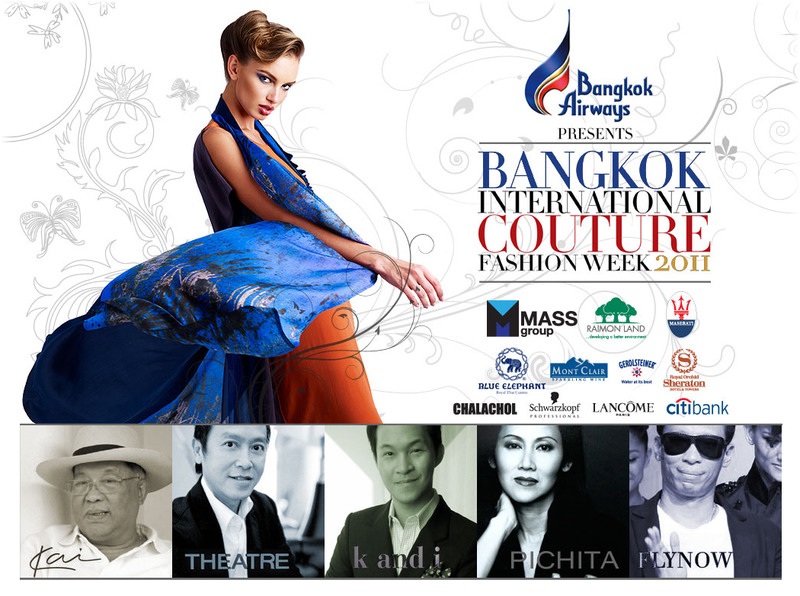 This is a particular honor as only four other brands will be featured, all of whom are well-established here in Thailand. As Tawn explained, these are brands he shopped when he was growing up, so to appear on the same stage as them is a rare privilege. As you can imagine, Tawn is honored, excited, and quite anxious right now. While 48 looks have been completed, he continues to edit and make adjustments and is now working with stylists to help produce the look and the feel of the show. As for me, I receive a near-daily update on the experiences of working with a legend and the interesting dynamics that entails. Of course, I’m very proud of Tawn, thankful that he has be given this opportunity, and look forward to sharing the collection with you in the near future. One commenter on my previous entry about making sausage expressed surprise about sausage being a part of Thai cuisine. Sure enough, Thais like stuffed intestines just as much as about everyone else! 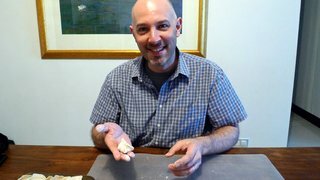 After posting the entry, though, I learned from a friend about a unique Thai sausage used as an ingredient in a clear soup. The sausage is called “look rok”. 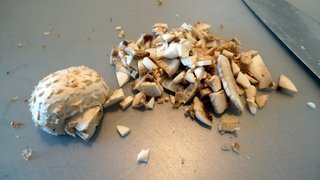 It is made by filling sausage casings (intestines) with uncooked, well-beaten chicken eggs. Then you boil the sausage until the egg firms up. The sausage is then sliced and, if you want to be decorative, the cut ends are scored into quarters. The pieces are added to a clear broth that has minced pork and whole shrimp added to it. Looks quite pretty, doesn’t it? Seems like a lot of work, though, for just one ingredient in the dish. Making sausages has long be on my “to try” list. They say that sausages and legislation are two things you don’t really want to see being made, but I was curious. 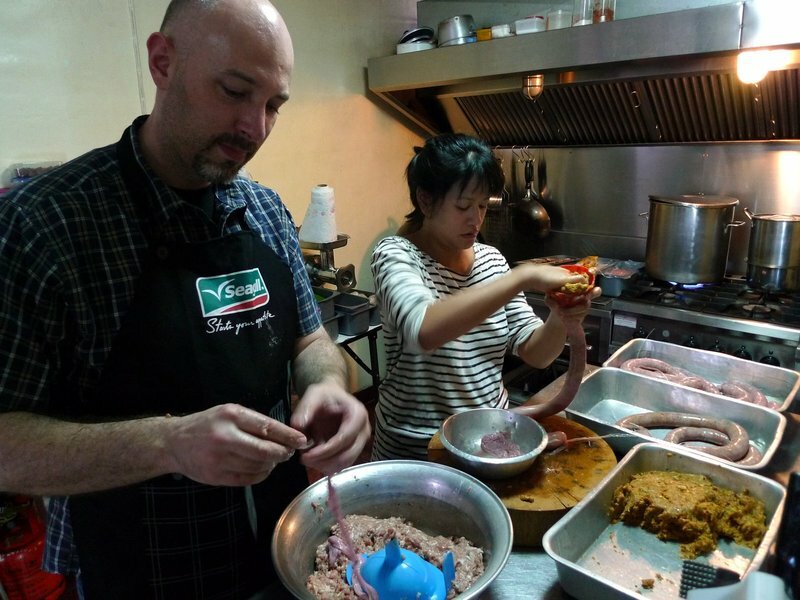 On hearing about my interest in sausage making, Jarrett Wrisley, food writer and owner of Soulfood Mahanakorn invited my friend Chow and me to his restaurant for a sausage making tutorial. This was much appreciated since I have neither a meat grinder or sausage stuffer attachment for my KitchenAid mixer. Halfway through the process, we have a few meters of sausage made and several kilos of bulk sausage left. Which will run out first: the casings or the sausage? 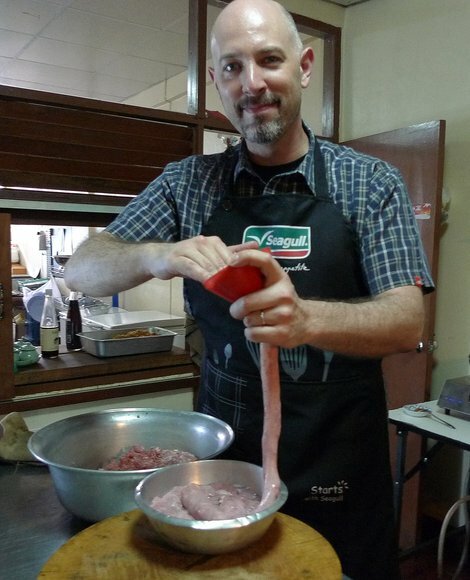 Prior to starting out on the project, I spent some time learning about sausage making. I borrowed a copy of Susan Mahnke Peery’s “Home Sausage Making: How-To Techniques for Making and Enjoying 100 Sausages at Home” from my friend Nat. Then I did some browsing on the internet to find some recipes that sounded interesting. The day before heading over to Soulfood Mahanakorn, I bought my ingredients, cut the meat into cubes and froze it (for easier grinding), and mixed the spices and seasonings. Chow and I met Jarrett at the restaurant just after noon. First off, we enjoyed a casual lunch of freshly baked baguette, mustard, and ham that Jarrett had made in his new smoker. 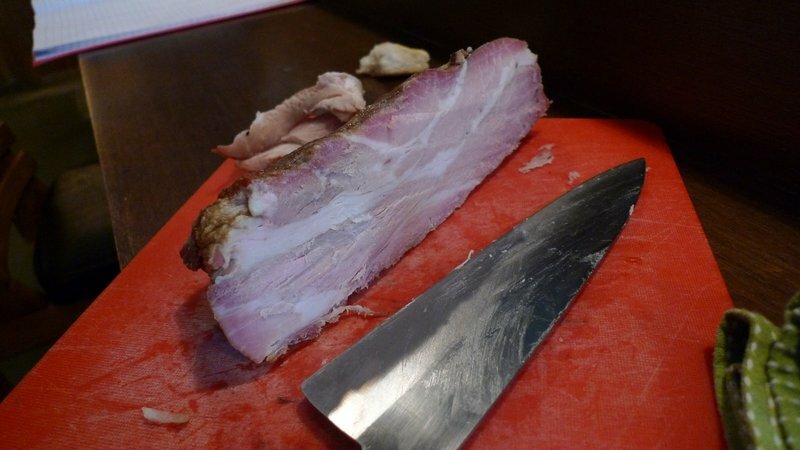 Smoked with the cuttings from various Thai herbs, the ham had a fantastic flavor, perfect to set the mood for some sausage making. 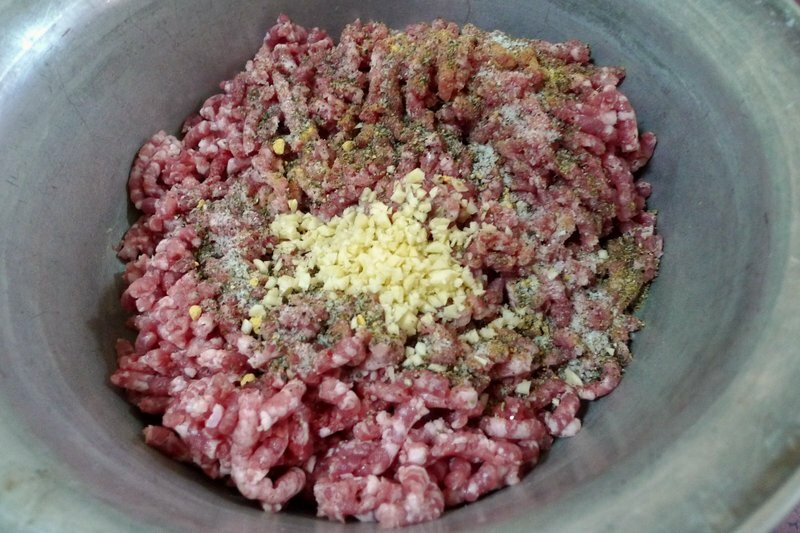 First step – grind the meat. I used two different meats, pork and chicken, to make two different sausages: Polish and chicken apple. 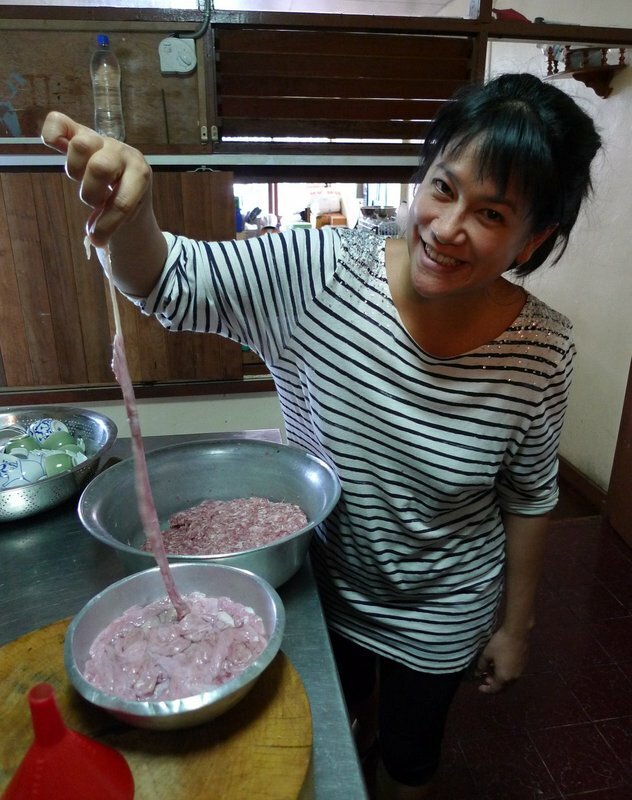 Chow made a third type of sausage, an herb and curry infused Northern Thai sausage known as sai oua. 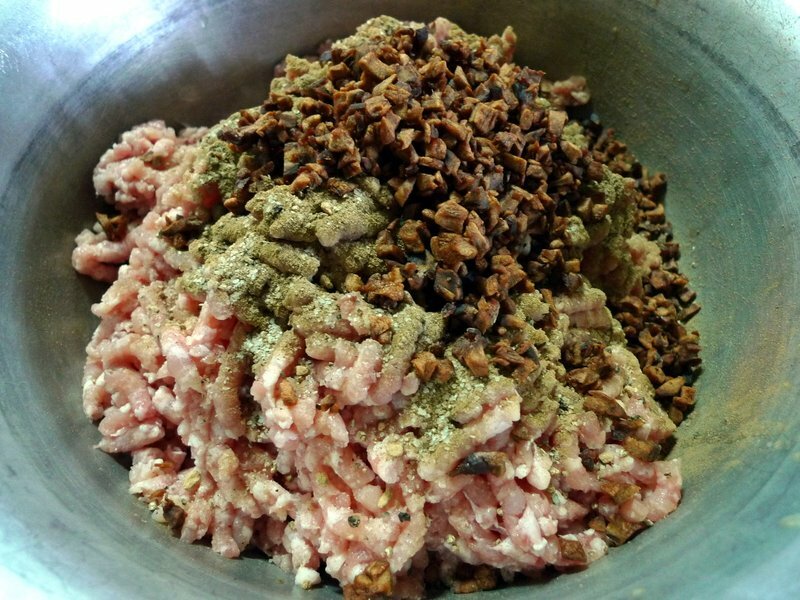 The ingredients for the Polish sausage: pork belly, pork shoulder, water, garlic, salt, marjoram, black pepper, dry mustard, and ground coriander seed. 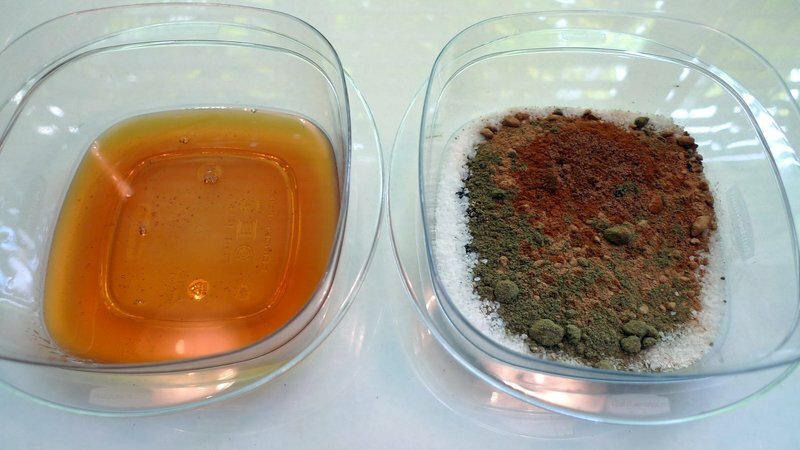 The ingredients for the chicken apple sausage: apple cider (reduced to a syrup), chicken thighs (with skin), dried apples, salt, black pepper, sage, dried ginger, cinnamon, nutmeg, and dissolved chicken bouillon. 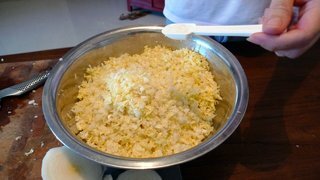 Chow made her sai oua using her grandmother’s recipe, or at least as much of it as she was able to pry from her grandmother’s cook. 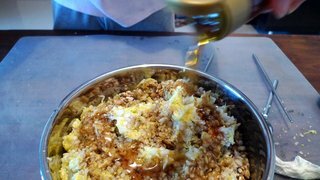 The secret ingredients she is adding to the ground pork include shallots, garlic, cloves, kaffir lime leaf, ground coriander seed, salt, fish sauce, turmeric, dried chilies, and a mixture of southern and central style curry pastes. And if you think there are any exact proportions to this recipe, you’re crazy! 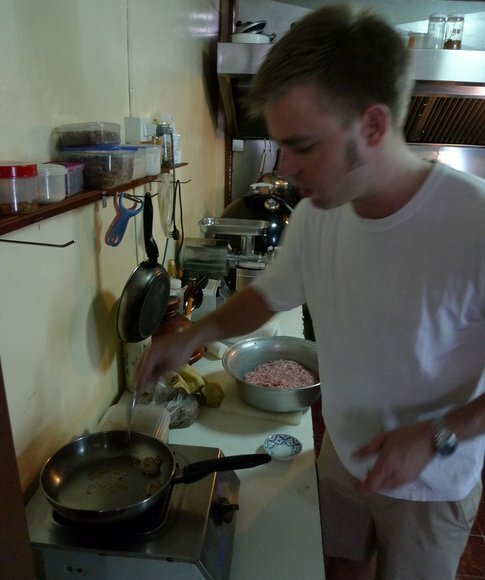 Jarrett fries up a test batch of the Polish sausage. He explained that his cooks will just taste the mixture raw to check the seasoning, presumably spitting out the mixture after tasting it. I’m not sure I want to be eating raw pork, even here in Thailand. Plus, since you will be eating the sausage cooked, it makes sense to me to actually taste it cooked. After we tested all three mixtures and were confident we had the seasonings correct, it was time to stuff. No fancy sausage stuffing machines here and certainly no synthetic sausage casings. 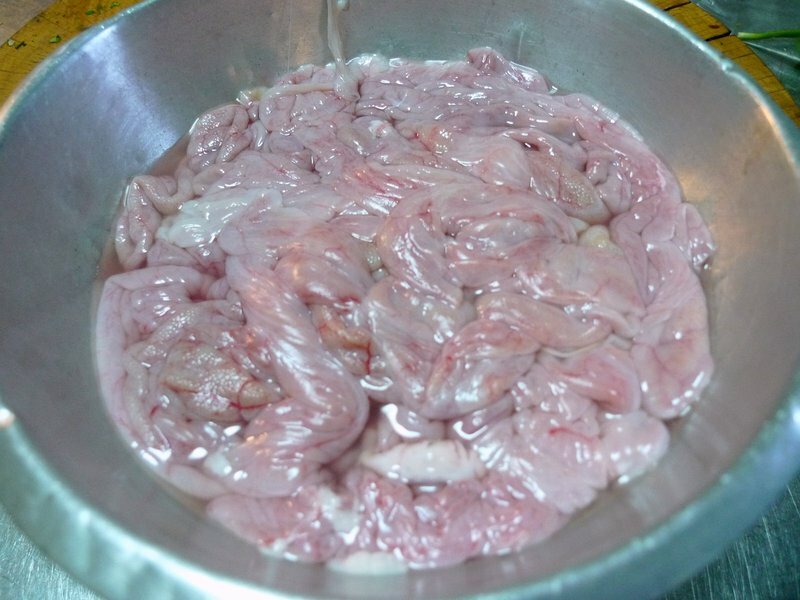 We used pig intestines fresh from the butcher’s, which had been rinsed countless times and treated with a little bit of lime juice to freshen the smell. 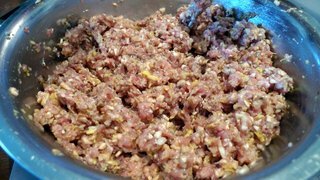 While I generally don’t consider myself a squeamish person, when you are making sausage with natural casings, there is no getting around the reality of what you are doing: filling a previously excrement-filled intestinal track with ground meat and seasonings, with the purpose of cooking and eating them. Eeew. Reminds me of those acts where a magician pulls an unbelievably long scarf from his mouth. Fun stuffing. Instead of using a stuffing machine, we hooked up the end of a length of intestine to a plastic funnel, tied off the other end of the intestine with some twine, and started stuffing. It is labor intensive, although not quite as much work as you might imagine. The biggest challenge is that you end up pushing lots of air into the sausage. Later, you need to prick the sausage with a skewer to let the excess air out. After about an hour of stuffing, we ran out of casings. The result was about 3 kilos, or 6 pounds of stuffed sausage, which I later tried twisting into proper links with a modest amount of success. We used only about two-thirds of our sausage mixture, though, so everyone went home with links as well as some bulk sausage. Unfortunately, I don’t have any photos of the cooked links, due to operator error on my part. (Note to self: you should not delete the pictures from your camera until ensuring they have actually copied onto the hard drive of the computer.) I do have photos of one of my experiments with the bulk sausage: frying up patties of the sai oua and making sandwiches from them. 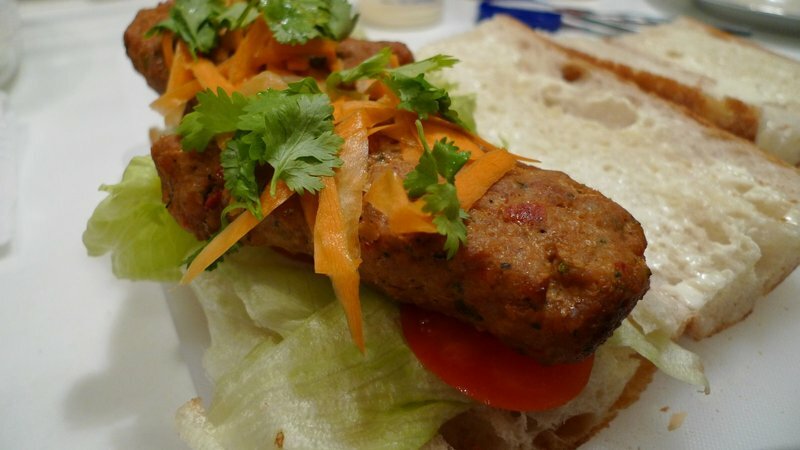 Tawn was skeptical at first because “this isn’t how sai oua is eaten.” Put it on a fresh baguette with some lettuce, tomato, carrots dressed in rice wine vinegar, a splash of fish sauce and a sprinkle of cilantro and you have a fusion between a Vietnamese bánh mì and Northern Thai sausage. It tasted wonderful. 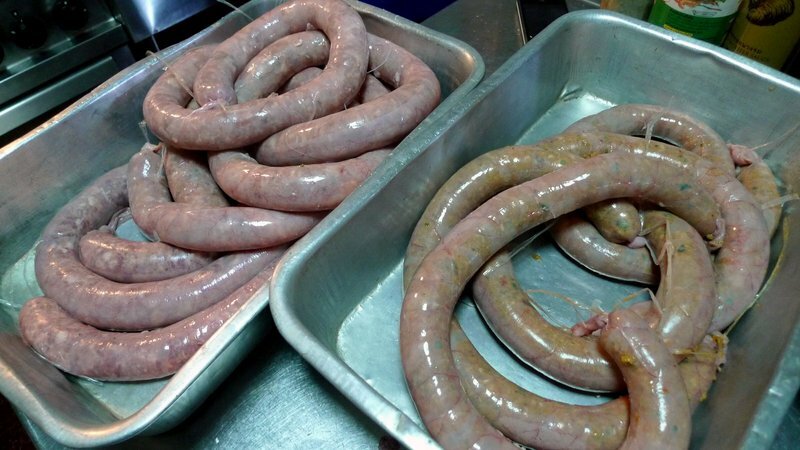 As for the overall sausage making experience, I would most definitely make sausage again. The ability to control your own flavors and ingredients is worth the effort. 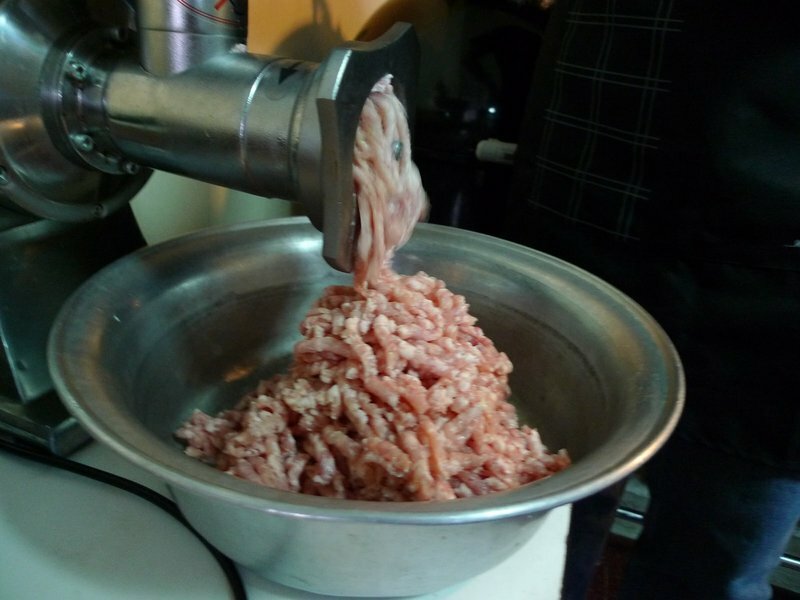 Next trip to the US, I’m buying a meat grinder and sausage stuffer attachment for my mixer. 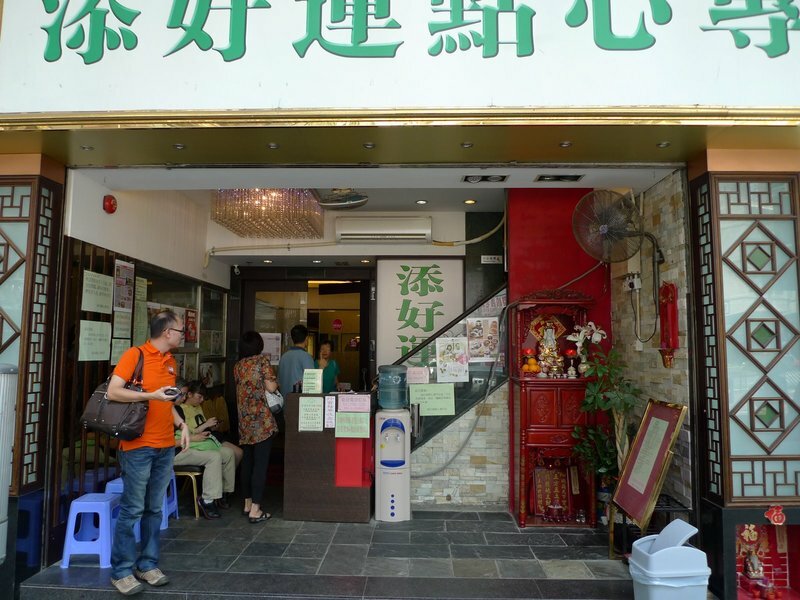 In April 2010, Tawn and I had the opportunity to visit Tim Ho Wan, the Michelin star winning dim sum restaurant in the Yau Ma Tei area of Hong Kong. When you hear “Michelin star” the normal image is of a big, swanky restaurant. Tim Ho Wan is quite the opposite, a modest twenty-seater emphasizing their food and little else. 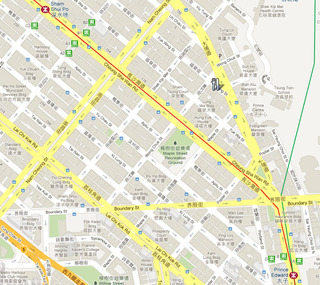 Because of the chef’s success, a second location was opened in Sham Shui Po, the fabric district in Kowloon. While in Hong Kong earlier this month, we stopped in for a visit. 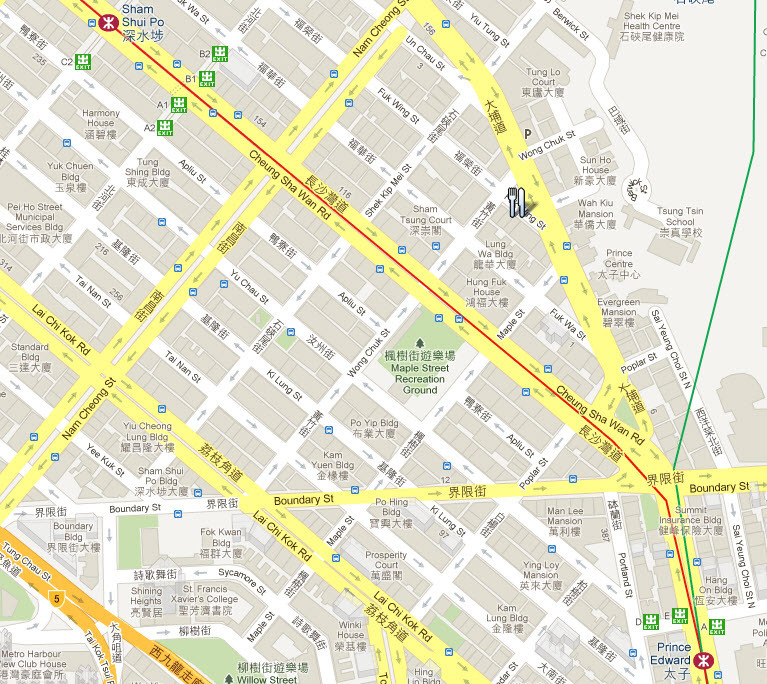 Located roughly equidistant between the Sham Shui Po and Prince Edward MTR stations, the second location of Tim Ho Wan is fairly easy to get to. Recognizing it will be a bit more challenging if you don’t read Chinese – there is no English signage. However, the street it is on seems to have no other restaurants, and most of the time you will see a queue out front, so that’s your clue that you are in the right place. There is also a third location now open in a decidedly more upscale and easier to reach spot: the MTR Airport Express Hong Kong station. Look for store 12A on level one. This way, you can zip into the city from the airport on a four-hour layover, have time to eat the Michelin star earning dim sum, and then head back to the airport! We headed to the restaurant about 11:00 am on a weekday, sneaking in between the morning crowd (the restaurant opens at 8:00) and the lunch crowd. That meant no wait for us, although just thirty minutes later the other tables quickly filled up. This second location is probably three times larger than the first, so waits are reportedly much shorter than at the first location, where waits longer than an hour are common. As for the food, it was still very good but I would dare say the quality and care of preparation is lower than we experienced at the original location. And, in one case, the hygienic standards were lower, too. 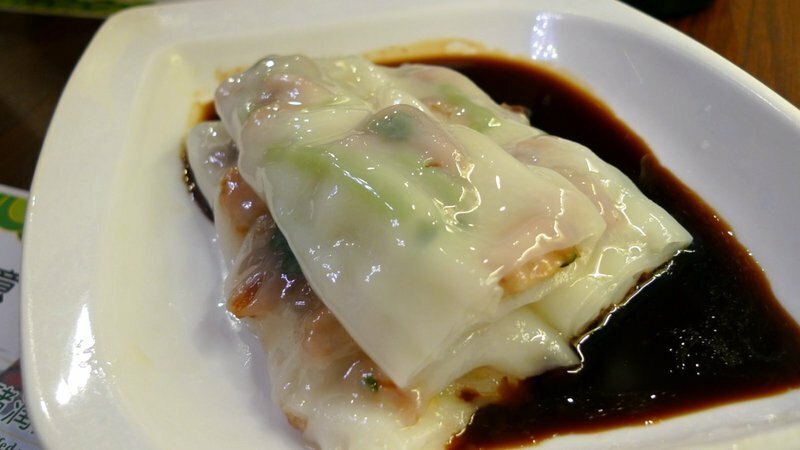 The cheong fun, wide rice noodles filled with pork, steamed, and served with soy sauce, remain a favorite of mine. Tim Ho Wan prepares them beautifully, with the most delicate and silky noodles I’ve ever had. 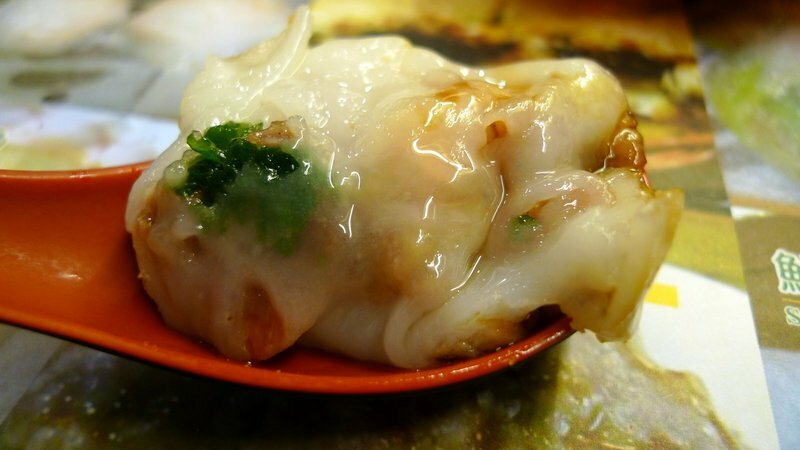 Close-up view of the cheong fun, called “vermicelli” on the menu. The dish is just HK$15, about US$2, and even at three times the price, I would classify it as a must-order dish. Another dish the restaurant is acclaimed for is its char siu bao, or barbecue pork buns. 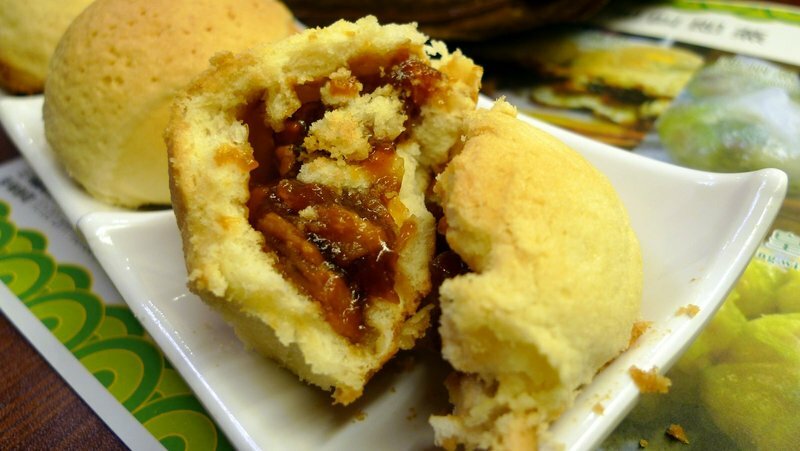 These are baked with a crumb crust on top and have a delightfully flaky texture. 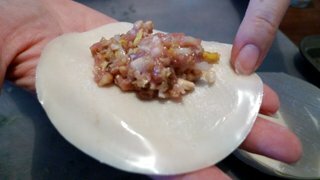 Inside view of the barbecue pork bun. 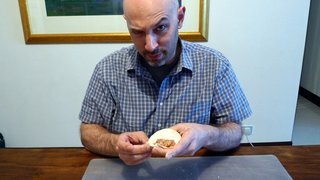 As I understand it, the origin of these bao is that restaurants would use the leftover pork from the previous evening’s banquets as the filling. Of course, that is probably not the case at most restaurants these days. 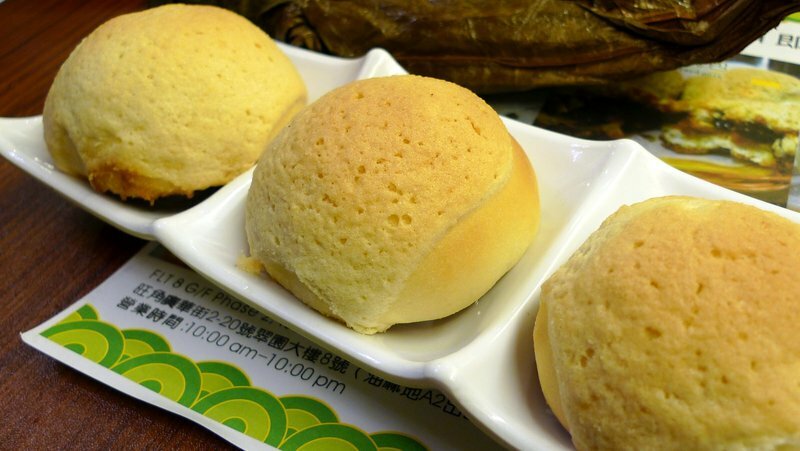 Tim Ho Wan’s are made of very high quality pork and I could eat a few servings of these buns and call it a day. 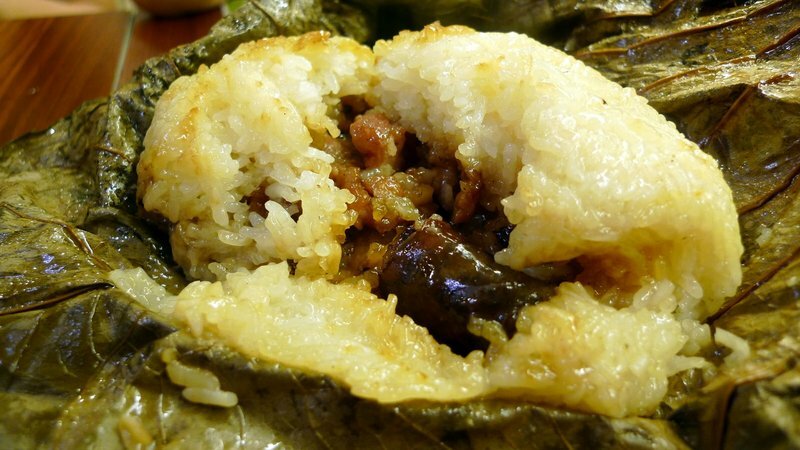 Another winning dish is what the menu calls the “glue rice dumpling”, or glutinous rice dumpling. Filled with sausage and other goodies then wrapped in a lotus leaf and steamed, this is the most generously-sized item on the menu – about the size of my hand with fingers open wide. 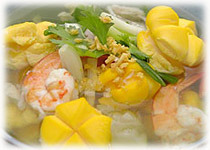 The quality of the ingredients is very high and the rice is very aromatic. 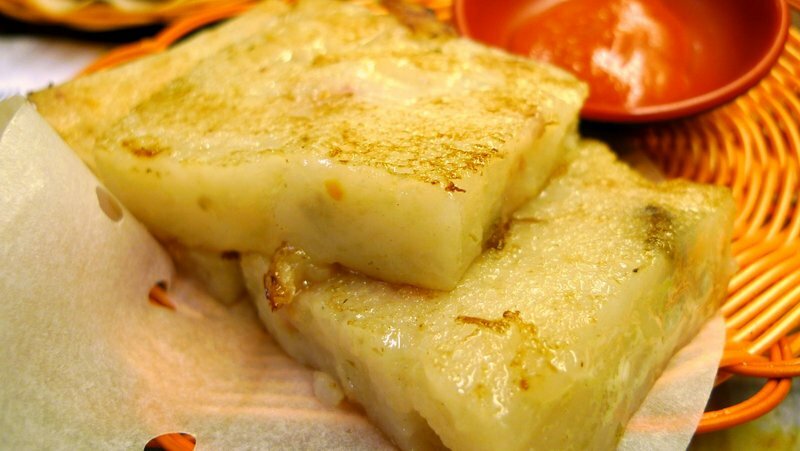 The pan fried turnip cakes, another dish that is usually a favorite of mine, disappointed. On our visit to the original Tim Ho Wan location, these cakes were fantastic, with a nicely browned crust and a flavor that comes from only the most seasoned of griddles. In fact, at the original location, this was my favorite dish. Unfortunately, the version at location number two was undercooked and uninspiring. 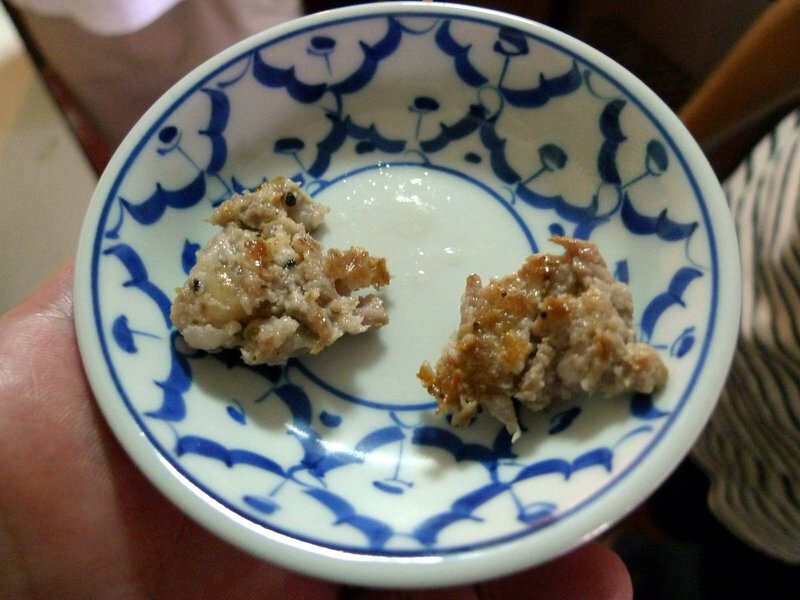 We made a wrong turn with the steamed beef balls in bean curd (tofu) skin. 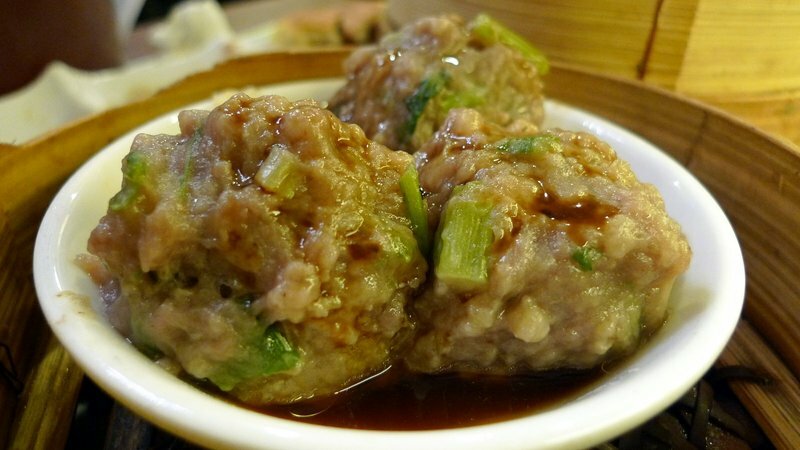 Commonly nicknamed “Chinese hamburgers”, these meatballs were cooked very rare. While I enjoy rare beef (steak tartare is wonderful), the texture didn’t work well in this dish. Additionally, one of our dining companions found a hair stuck in one of the balls. We brought this to the attention of a server, who replaced the dish but did not offer any compensation. While I know that Hong Kong doesn’t have a reputation for good customer service, the least I would expect at a Michelin starred restaurant (at any decent restaurant, for that matter) is that we not be charged for the dish that had to be replaced. 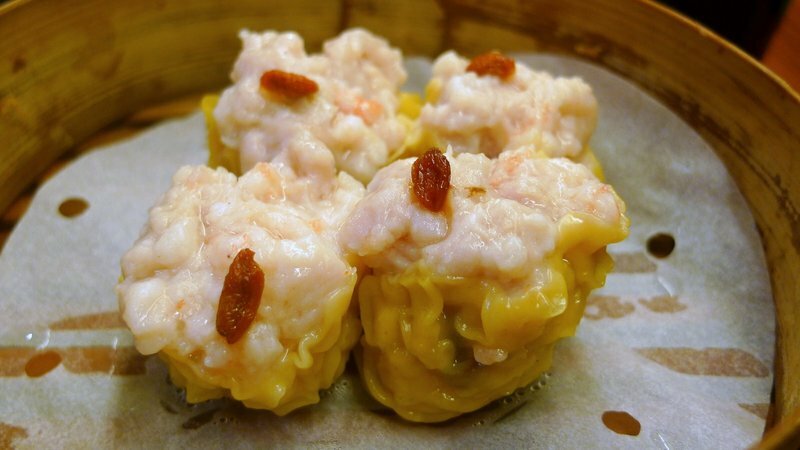 We headed back on track with the siu mai, steamed pork dumplings with shrimps. These mainstays of dim sum were tasty, although there was nothing particularly impressive about them compared to siu mai I’ve had at a dozen other dim sum restaurants. 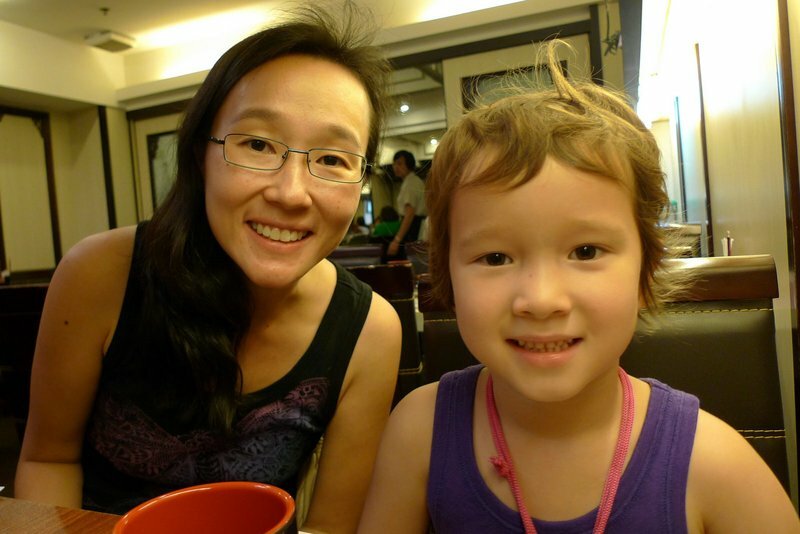 Dining companions Tehlin with her daughter. When I ordered, I ordered for four hungry adults, forgetting that a child isn’t going to eat nearly as much. Oh, well, more for the rest of us! Chris, Tawn, and Chinese aunty. For dessert, we ordered two types of warm, sweet soup. One was the corn and purple glutinous rice and the other was green peas with sea lavender (a type of fragrant seaweed). Both were tasty but didn’t photograph very well. The third dessert, described as “tonic medlar & petal cake”, was tasty and beautiful. 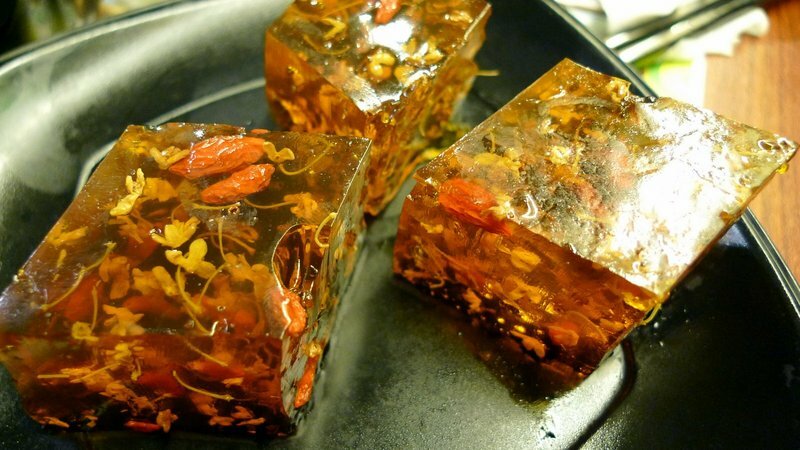 It is a gelatine of dried flowers, probably Chrysanthemum, that was beautifully golden and wonderfully aromatic. This is the type of dessert that is at once very simple – Jell-O! – but also very dramatic. All told, we had twelve dishes and tea for four, and the bill came out to UK$177, about US$24 for three and a half people. While we did have the hair in the meatball incident and three dishes that were only average, the remaining dishes (especially the cheong fun and char siu bao) were fantastic and well worth the effort to find the restaurant. One of my favorite cooking-related websites is Week of Menus. 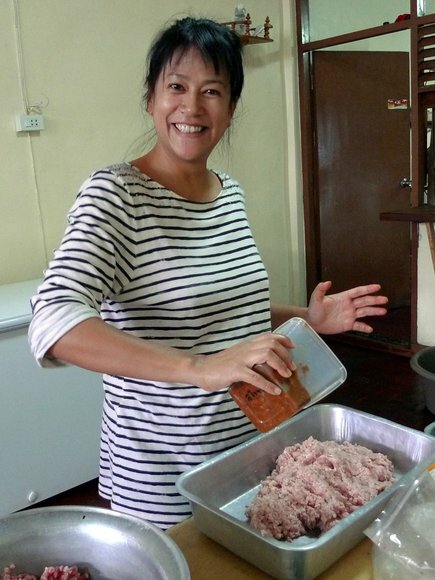 Written by Joanne Choi, a mother of young children who tries to provide, as she puts it, good cooking for people with too much on their plate. I’m sure we can all relate to that feeling. 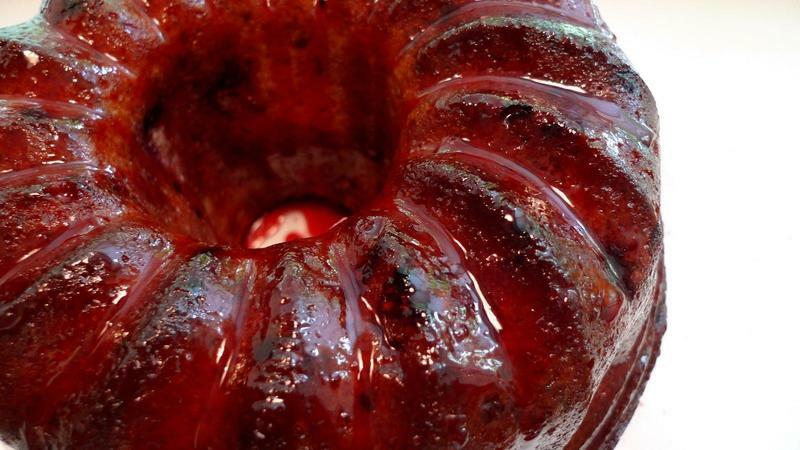 Recently, she’s done a series of recipes about bundt cakes and the chocolate raspberry bundt soaked in raspberry syrup caught my eye. Something nice about bundt cakes is that they have a high degree of fancy with a relative minimum of work. The pans themselves are very grandly designed, some with arches and vaults worthy of a cathedral, others with giant ridges, and still others with rose patterns. With such a beautiful cake, there’s no need to frost or ice them, although a nice glaze moistens the cake and makes the architecture even more beautiful. 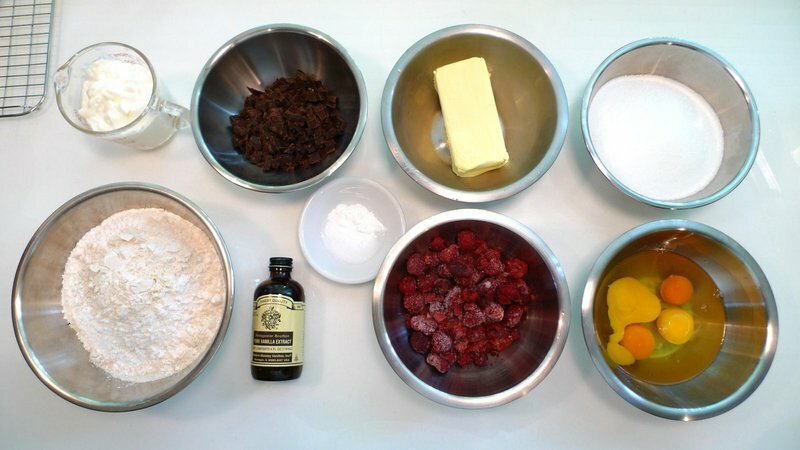 The ingredients are pretty simple (you can go to Joanne’s website for the exact recipe): All-purpose flour, baking powder, baking soda, salt, unsalted butter, granulated sugar, eggs, vanilla extract, sour cream, a chocolate bar broken into pieces, and raspberries. 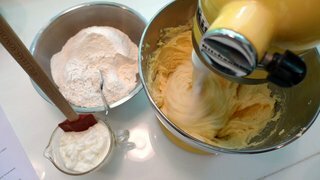 First you combine the flour with the salt, baking powder, and baking soda. 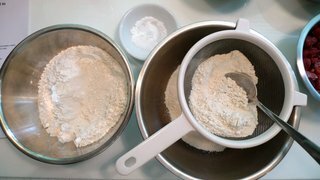 The recipe does not call for sifting the flour, but the organic Australian flour I buy here in Thailand is a little coarse, so sifting helps combine the ingredients while also lightening the flour. 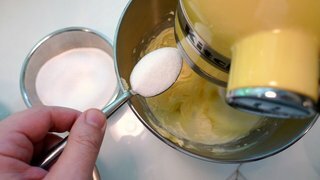 Next step, cream the butter in a mixer until it is light and fluffy, then beat in the sugar. 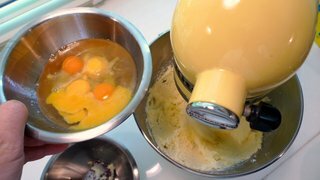 After the sugar and butter are combined, add the eggs one at a time, beating for about thirty seconds between each addition. 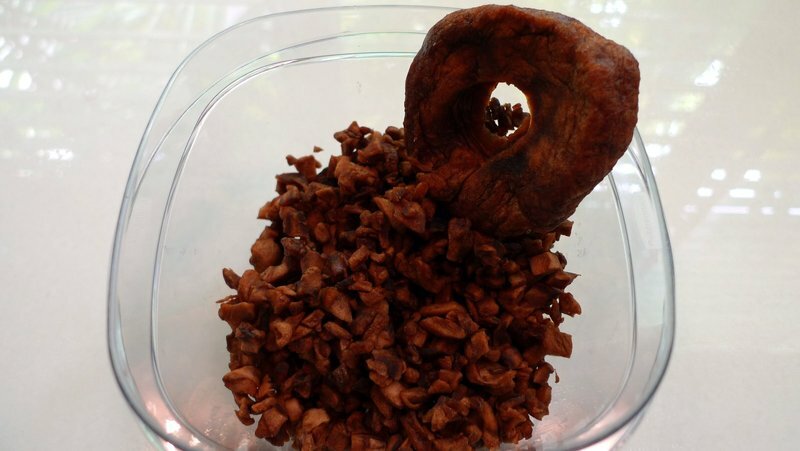 Of course, you need scrape down the sides of the bowl every so often along the way (or buy a BeaterBlade, which combines the paddle attachment with silicon edging that scrapes down the bowl as it mixes) so that the ingredients are well-combined. Then start adding the flour mixture and the sour cream (to which I had to add a little bit of yogurt as I didn’t have quite enough sour cream) in alternating parts. 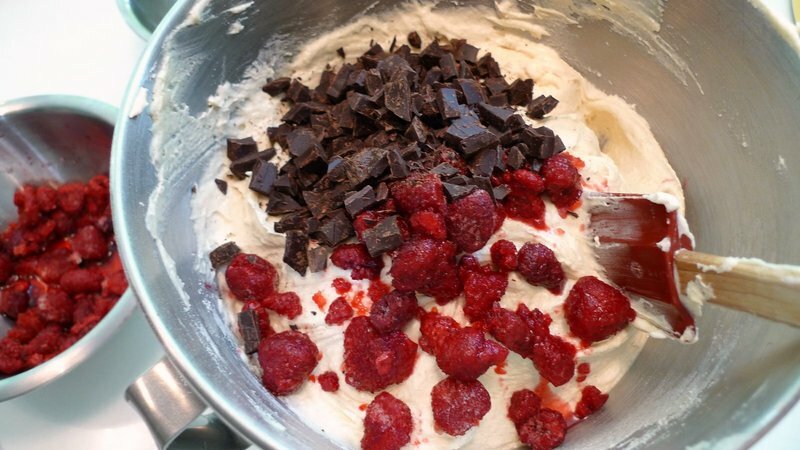 The final step is to fold in the broken chocolate pieces and about half the raspberries. Now, the recipe calls for fresh raspberries but I found that frozen works just fine. 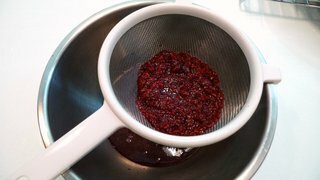 Manually incorporate the chocolate and berries instead of using the mixer, so that you are sure they are evenly distributed. 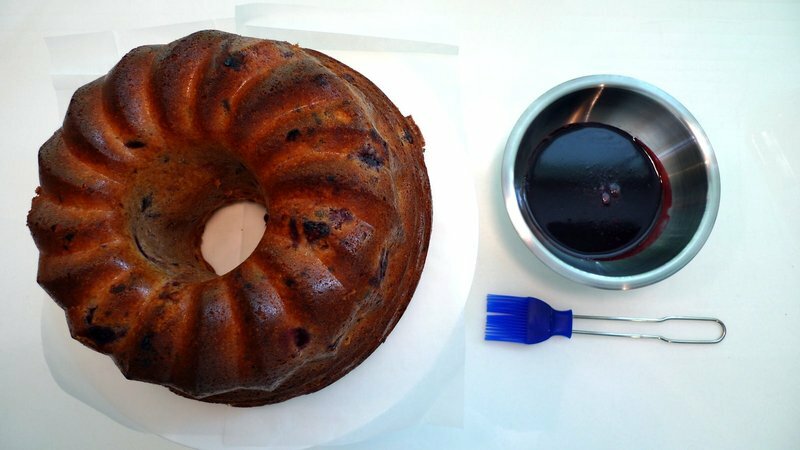 Put the batter into a bundt cake mold and bake. I didn’t have a bundt cake mold but had been thinking about buying one. This recipe gave me the incentive to make the purchase. While comparing models, I decided to buy my first silicone baking mold. 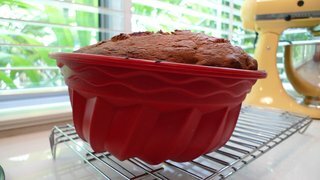 It is less expensive and supposedly easier to use (no need to butter and flour the mold – it just peels right off) than metal baking pans. 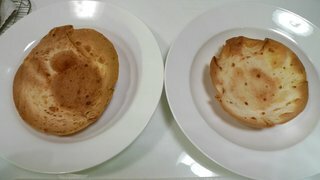 Overall, I was impressed by the ease of use, but for some reason the batter shifted in the pan, causing one side of the cake to be larger than the other. Maybe I need to place the pan on a tray before putting it in the oven? While the cake baked, I made the glaze. This is a combination of the remaining berries, some sugar, and a little bit of orange juice. 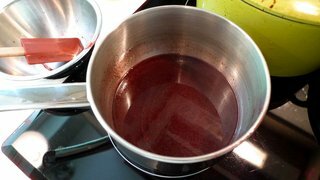 The berries are pureed and strained so you get a rich raspberry juice. The juice is then combined with the sugar and orange juice and cooked for a few minutes until the sugar dissolves. You can easily imagine how other fruits could be used instead of raspberries to produce tasty alternatives to the raspberry cake. After the cake was done and had cooled a bit (although not completely), you begin brushing on the glaze. Notice how lopsided the cake is! I also think it is a little overcooked. When I checked the cake initially, the toothpick was coming out dirty, so I gave it a few more minutes. By the time the inside was done, the outside was a little too brown. Perhaps I need to lover the oven temperature a little? I added the glaze in two layers, allowing about ten minutes for the first layer to absorb. There was a point where the cake seemed adequately glazed and I had used only about two-thirds of the raspberry glaze. In hindsight, I would go ahead and apply a third layer as there is not much risk of the cake being too moist. The final product, served with some white chocolate and raspberry ice cream from New Zealand Ice Cream. You can se this slice came from the thin side of the cake! Overall, the flavor was nice, although I think the cake was slightly overcooked and just a little dry. 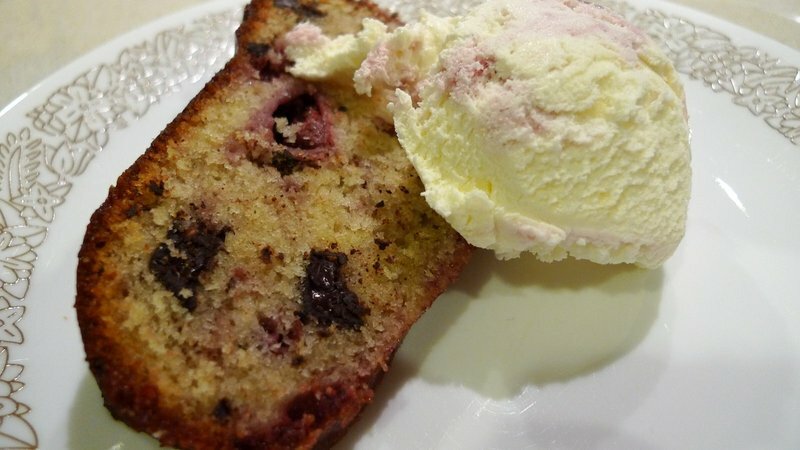 I would like to play around with this recipe again, maybe adding more berries to the batter or else maybe a little more sour cream. In any case, thanks to Joanne for this nice recipe! 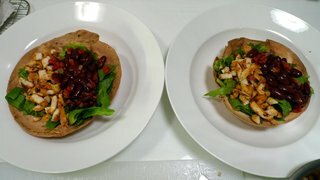 A picture posted by my cousin Jane was all it took to inspire me to try making taco salad at home. But something I didn’t want to deal with was deep frying tortillas to make the taco bowls. Not only does deep frying add a lot of fat (and, thus, heaviness) to the meal, but it is also more work than I want to deal with. 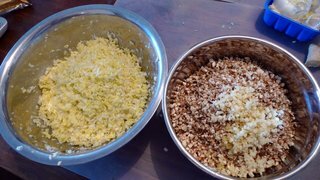 The key was finding an easier, lower fat way to make the taco bowls. 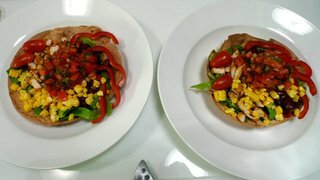 After some searching on the internet, I found two techniques for baking taco bowls that sounded promising. The first involved spraying a tortilla with cooking spray (Pam, Crisco, or another brand). The second technique involved pouring a tablespoon or so of oil on top of about an inch of water in a large container such as a roasting tray and then dipping the tortillas into the water. Regardless of which method you used, you then shaped the tortilla between two oven proof bowls and baked for about five minutes in a 400 F oven. 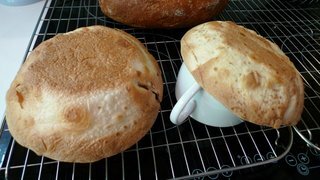 Ofter that, you remove from the bowls and bake the bowls another five minutes until crisp. Both techniques work well, although if you are going to spray the tortilla you need to be careful about overdoing it. 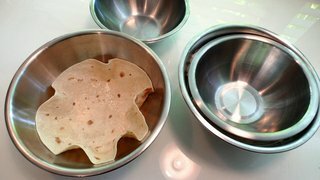 It also works better if your tortillas are at room temperature or even zapped in the microwave for a few seconds before trying to shape them, otherwise they may crack or tear. The flavor of the baked bowls was very enjoyable, albeit less oily than with the fried bowls. 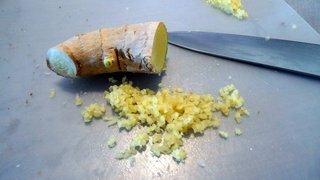 As for ingredients, you could use whatever suits your budget, sense of taste, and amount of prep time. 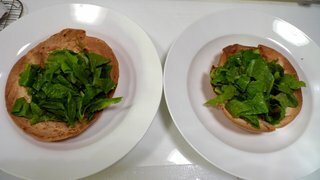 I used chopped romaine lettuce for a base, although mixing in some spinach or other greens would have been a nice alternative. To the lettuce I added chicken and beans. The chicken had been marinated in a coconut chili sauce that I had handy, although simply sprinkling the chicken with some salt, pepper, and cumin and pan frying would have been fine, too. For the beans, I drained a can of kidney beans (no black beans were available at the store), then cooked them for just a few minutes with some chopped onion and chopped red bell pepper. On top of the protein, I aded freshly boiled corn, chopped tomatoes, and some more red bell pepper. For a dressing, I used homemade tomato salsa, although if it were the right season, some homemade mango salsa would have been spectacular. 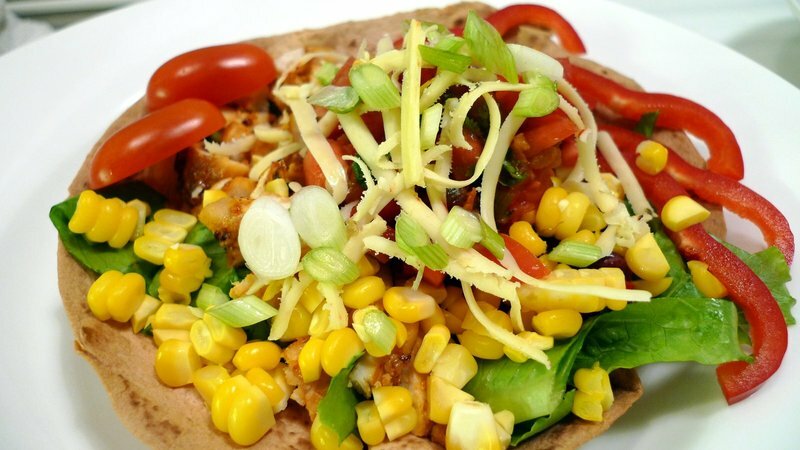 Garnished with some shredded pepper jack cheese and sliced green onions, these taco salads made for a healthy and tasty treat. Many thanks to Jane for inspiring me. 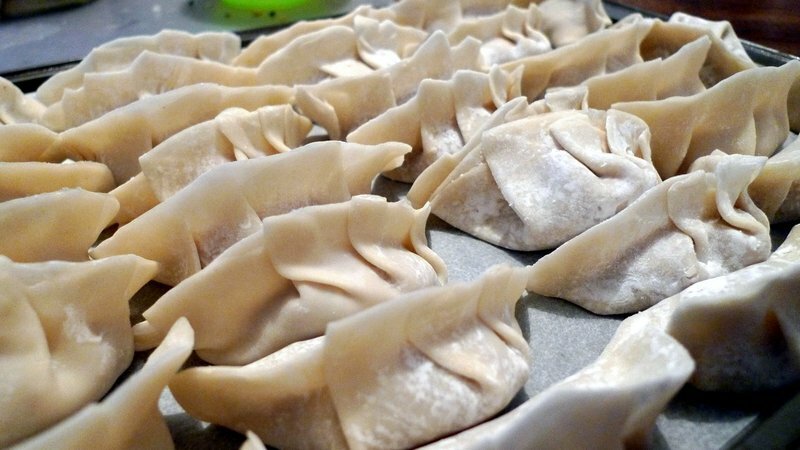 Pot stickers, known as guotie in Chinese or gyoza in Japanese, are my favorite type of dumplings second only to xiao long bao, of course! I recently had the opportunity to learn how to make them, particularly the tricky art of correctly folding the seams, when I visited my friend Tehlin in Hong Kong. Tehlin and I went to university together. Of Chinese heritage by way of the Philippines, she has tried to teach me how to make pot stickers on previous visits but my fingers were to clumsy or my patience too thin. This time, though, I overcame the obstacles and learned how to turn out a proper pot sticker. 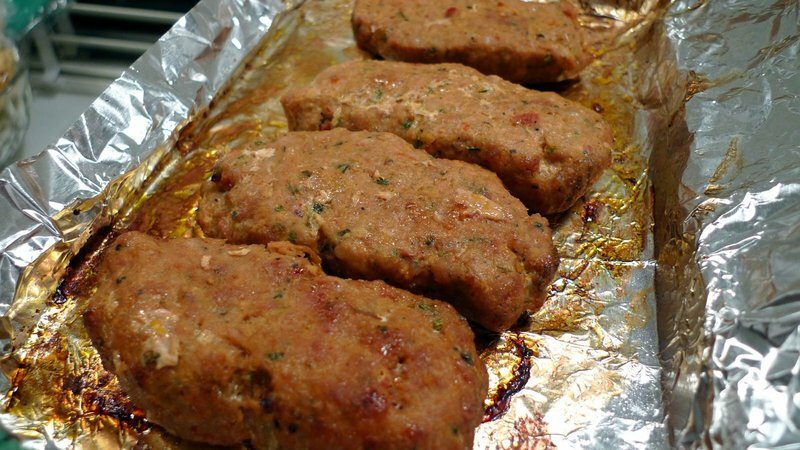 To make the filling, you use fresh ground pork and, if you like, chopped shrimp meat. 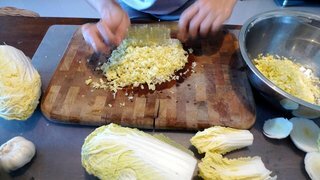 Finely chop Napa cabbage, mushrooms, and a small amount of garlic. 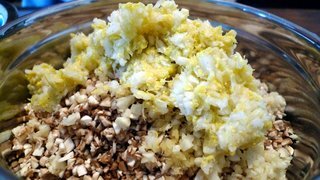 Once the vegetables are chopped, add a teaspoon of salt to the cabbage, stir it, and let it sit for a few minutes. This will draw the water out from the cabbage. After the water has been drawn out, squeeze the cabbage and then add it to the mushroom, garlic, and meat mixture. 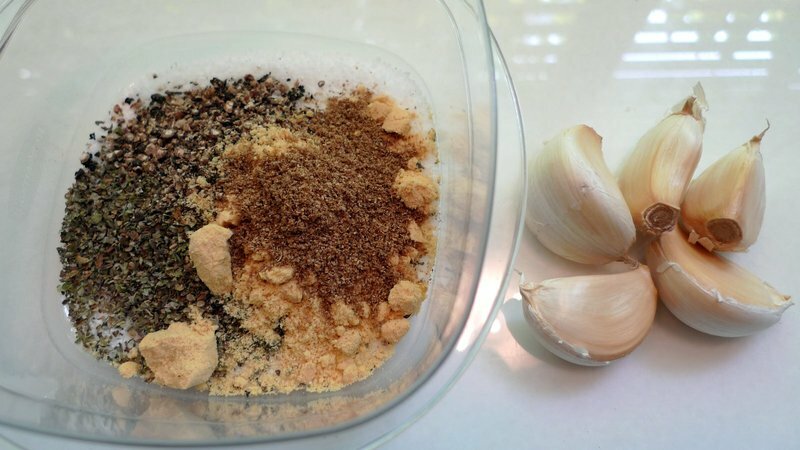 Mix well, seasoning with some soy sauce, sesame oil, and ground white pepper. 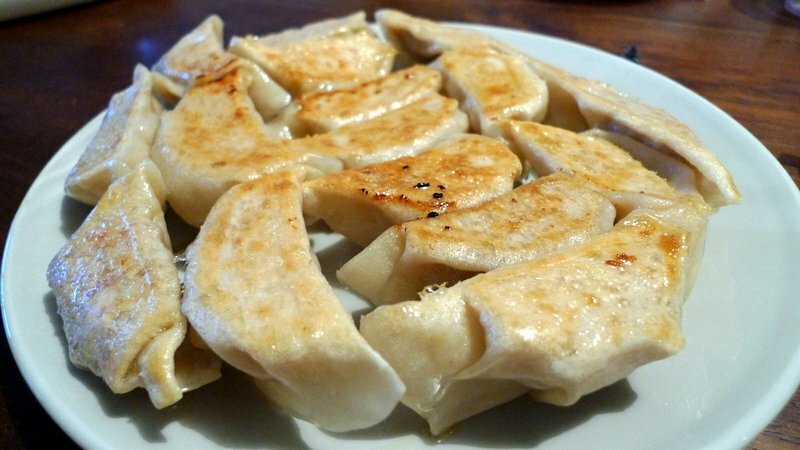 If I understand the proportions correctly, about 1 kg (2 pounds) of meat will make about 100 pot stickers. The hardest thing for me to comprehend and do was to correctly seal and fold the seams. While I finally figured it out, I’m still quite clumsy about the process. 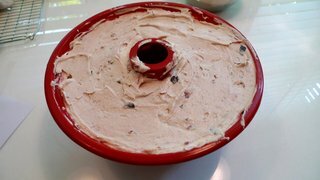 First, place about a tablespoon of filling in the middle of a wrapper. We bought them premade from the local noodle vendor. Wipe the edges with water then hold like a taco. Start by pinching one end. 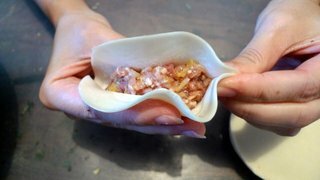 Then, using your index fingers, create a flap about one-quarter of the way across the edge of the dumpling. 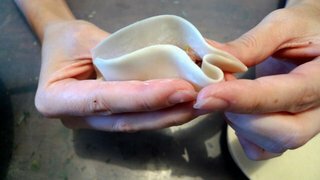 The flap will fold over towards the already sealed end of the dumpling and is then pinched closed. 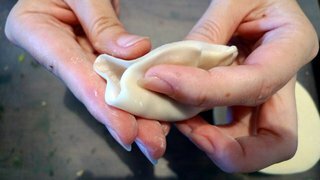 Make another flap about half way across the edge of the dumpling, folding it over and pinching, too. 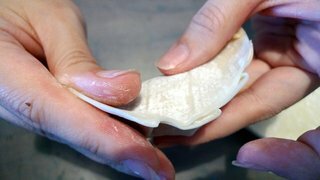 A final flap is made about three quarters of the way across the edge of the dumpling. After is it folded and pinched, the unsealed end is pinched together. It looks so easy when Tehlin does it, just a blur of dumpling origami. Me trying it was another matter. 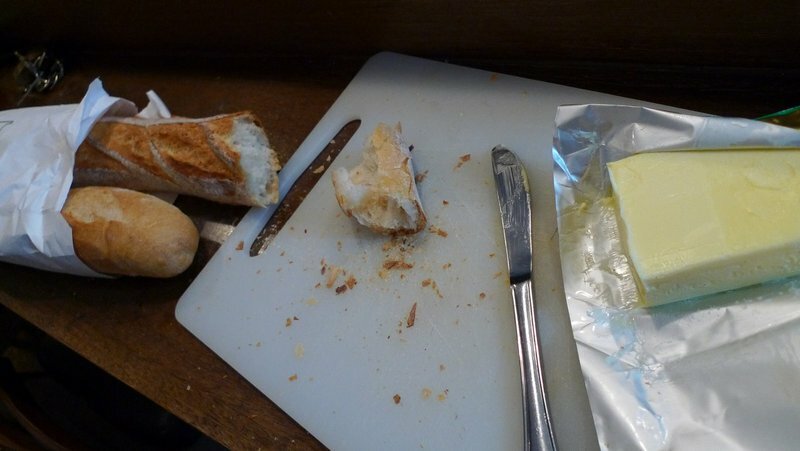 Ultimately, I found it easier to set the wrapper on the table after making the first pinch, instead of trying to hold it in my hand. After a few rough starts, I got the hang of it. We soon filled two trays, a mixture of Tehlin’s beautiful pot stickers and my less consistent ones. Nonetheless, they turned out looking pretty good and I look forward to making some back at home. Oh, and they tasted great, too.